Dear Readers , Maya is the Upcoming new Show of Zindagi tv launching from 12 January 2015. 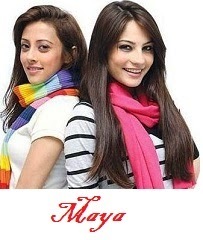 Maya is a Television Drama series which is originally broadcasting on Pakistani "Geo TV " in Urdu language from May 2011 to Present with the name of "Meri Behan Maya". It is Directed by "Azfar Ali" and produced by Khurram Raza . Sisterhood is a beautiful relationship; at one instant you see sisters are fighting with each other, and at another moment they become best friends and behave like it never happened. Sisters always support each other against any pessimistic attitude, and guide each other through thick and thin. The same applies to the story of Maya and Zarmeena! ‘Maya’ is the depiction of two sisters’ love and support, and they are the apple of the eye of their father; his decisions are always influenced by keeping the priorities of daughters. Maya is possessive and an upfront, person who always speaks what her heart drives her to say and thus always getting into trouble, whereas Zarmeena is sensible and she covers up Maya’s mess. They live with their father Shahzaib in Murree, who is a Senator and he is a kind of father who has grown his daughters by empowering them with confidence. Directed by Azfar Ali, the writer is Hasina Moin, who is back again with this serial where she portrays the female protagonists as fearless and living their lives on their own terms. The script is refreshing to see the great bond of sisters who instead of pulling each other down as seen in other serials, support and encourage each other. Shahzaib has already married Atia Begum and kept it hidden from his daughters until they grow mature enough to absorb this shock… both Maya and Zarmeena get upset by the news but later, accept the second wife of their father only for his happiness. However, Atia Begum comes to Murree, she is not the way as perceived. Maya does not like her stepmother; as she irritates her by playing different tricks on her, but Zarmeena is more cautious. If this is not all, Atia’s son steps in; who makes it worse for Maya to live in her home. Zarmeena, on the other hand, consoles her sister to stay calm, but with Rashid and her stepmother, it becomes harder day by day! Zarmeena moves to her friend’s house, where she falls in love with her neighbor, Faizur, though his father is not in favor of his son’s love. Meanwhile, Maya also runs away from the home when Atia conspires against her with a revelation that she is not Shahzaib’s daughter. This is a huge blow for Maya and heart-wrenching after which she finally decides to elope. Will Maya be able to find out the truth about her birth? Can Zarmeena find Maya after her escape? Will Shahzaib get to know the true colors of Atia Begum? These questions definitely add to the interest for the viewers! Maya's title song Tell Me Why is sung by Mehwish Hayat, composed by Waqar Ali and lyrics by Muhammad Nasir. The song of this drama serial became immensely popular due to its different lyrics and catchy music. The lines of the song are frequently used during the course of the show. Sorry Timing is not Yet Announced by Zindagi Tv show.Stay updated with newstechcafe.com for new updates.